Tumblr is a powerful and easy-to-use blogging online service that will enable you to establish your personal online presence on the web in no time. With tools that surpass the offerings of many other popular blogging services such as Wordpress and Blogger, Tumblr truly expands the way you can express yourself to the world. 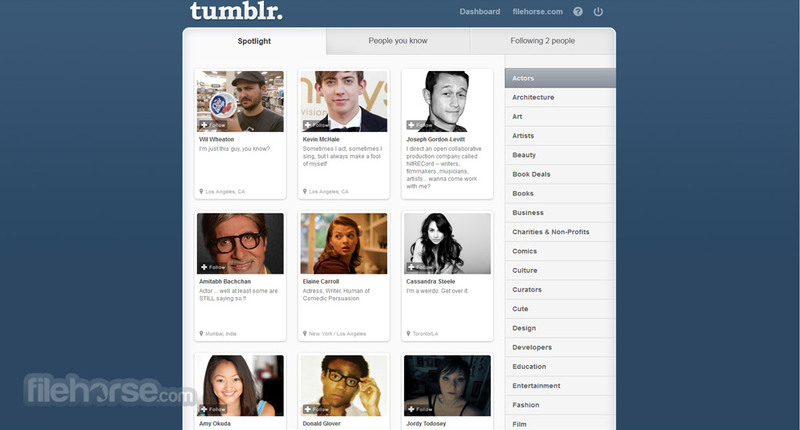 Focus on social connections is one features of Tumblr that truly separate it from other similar services. Not only that it offset tight integration into any type of content you can create (text, images, videos, notes, audio, links, and other) but it also can serve as you communication center and a link to the rest of the world, your friends and blog visitors. After only few minutes of work, you can set up you blog, choose one of the many predefined themes and start publishing content immediately. Create own blog today! One of the most popular microblogging platforms in the world. 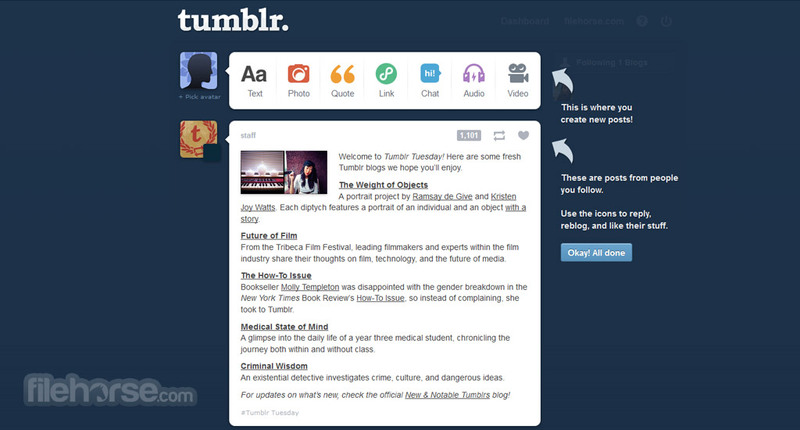 Tumblr is one of the most popular microblogging social networks in the world, crated to enable everyone to easily create, upload, share and your content in an online destination that promotes sharing of several types of media in one blog post - text, pictures, vides, music, links, drawings, quotes, and more. Usually mixing short texts and images (static or animated), Tumblr community managed to rise to the unprecedented levels for this kind of service, today being in the top 25 most visited websites in the world. Such popularity has arrived with the ease of sharing and discovering content, which can be done both browser pages, or from your mobile devices such as smartphones and tablets (both iOS and Android are supported with native Tumblr apps). Strong sense of community is strengthened with great tools for communications, following new uploaded content in real-time and deep customization options for each user. With more than 143 million blogs and 65 billion posts, Tumblr is easy place to visit, discover content, meet friends, and start contributing. Tumblr gives everyone easy chance to share content of almost any kind using short updates that you can create either on your PC or on the go on you mobile device. By being more capable that Twitter and more user friendly than Facebook, Tumblr manages to satisfy everyone who tries it. Tumblr is popular not only because it is easy to use, but also because it has intuitive interface that encourages sharing, commenting and discovering new content. From the moment you arrive on it you will be welcomed with the stylish login page, and from then, you are off to discovering new things. Searching for blogs can be done by blog name, username or by tags, with the focus to list you content in thumbnail view filled with never-ending content. Individual blogs have widely varied styles, ranging from fun and colorful to strictly professional and serious looking. Time to learning how to navigate and use Tumblr is brought down to a minimal level, with user-friendly features scattered around in easy-to reach places. Newly created profile will showcase to the world your username, avatar icon, your first blog posts that can have their own tags for easier sorting, social network links, and optional contact information and bio. All of that can be created with really minimal effort. Just as many other social networks, Tumblr has managed to gather its user base and good reputation by being focused on providing excellent free service. Visitors are encouraged to create new account immediately upon arriving on Tumblr, and from there they can post as much as they want, as often as they want, without ever needing to pay a dime. More professional users who really want to make their blog pop with design and innovation can visit a special web store called Theme Garden, where they can pick and choose one of the thousands professional made themes whose prices range between 10 and 50 dollars. Creation of new account requires you to provide valid email password. You cannot create account by using your credentials from Facebook, Twitter, Google+ and other social networks. Enabling everyone to freely distribute content in a form that is definitely larger than Twitters 140 characters, and more expressive than Facebook, Tumblr represents the service that will continue to grow and attract new users. If you are willing to share or discover a whole new world of interaction with the internet, we encourage you to visit Tumblr right now. 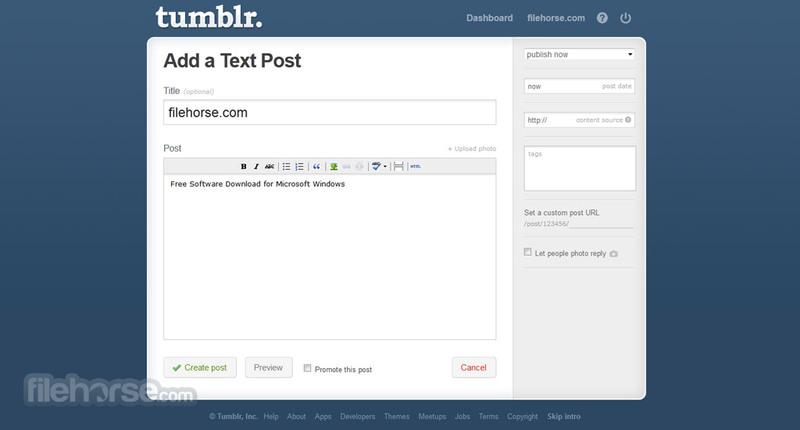 Create a free website or blog with Tumblr!